Over 400 years ago, sky watchers -- including the famous astronomer Johannes Kepler -- noticed a bright new object in the night sky. Since the telescope had not yet been invented, only the unaided eye could be used to watch as a new star that was initially brighter than Jupiter dimmed over the following weeks. Chandra's latest image marks a new phase in understanding the object now known as Kepler's supernova remnant. By combining nearly nine days of Chandra observations, astronomers have generated an X-ray image with unprecedented detail of one of the brightest recorded supernovas in the Milky Way galaxy. The explosion of the star that created the Kepler remnant blasted the stellar remains into space, heating the gases to millions of degrees and generating highly energized particles. 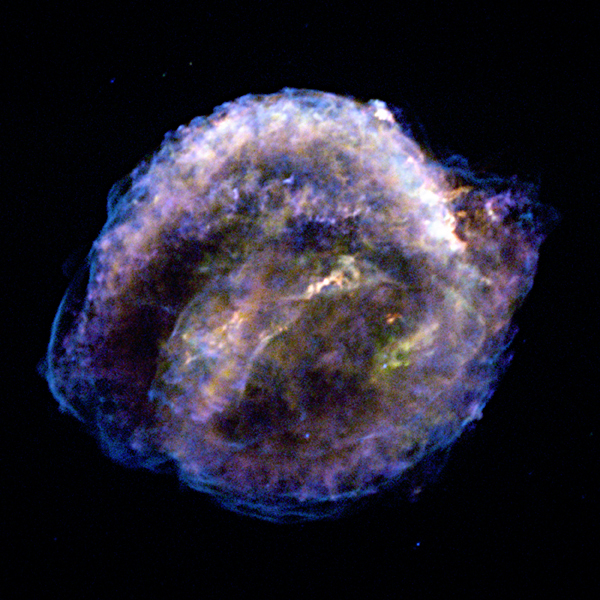 Copious X-ray light, like that shining from many supernova remnants, was produced. Astronomers have studied Kepler intensively over the past three decades with radio, optical and X-ray telescopes, but its origin has remained a puzzle. On the one hand, the presence of large amounts of iron and the absence of a detectable neutron star points toward a so-called Type Ia supernova. These events occur when a white dwarf star pulls material from an orbiting companion until the white dwarf becomes unstable and is destroyed by a thermonuclear explosion. On the other hand, when viewed in optical light, the supernova remnant appears to be expanding into dense material that is rich in nitrogen. This would suggest Kepler belongs to a different type of supernova (known as "Type II") that is created from the collapse of a single massive star that sheds material before exploding. Type Ia supernovas do not normally have such surroundings. A team of astronomers, led by Stephen Reynolds of North Carolina State University in Raleigh, N.C., was able to use the Chandra dataset to address this mystery. 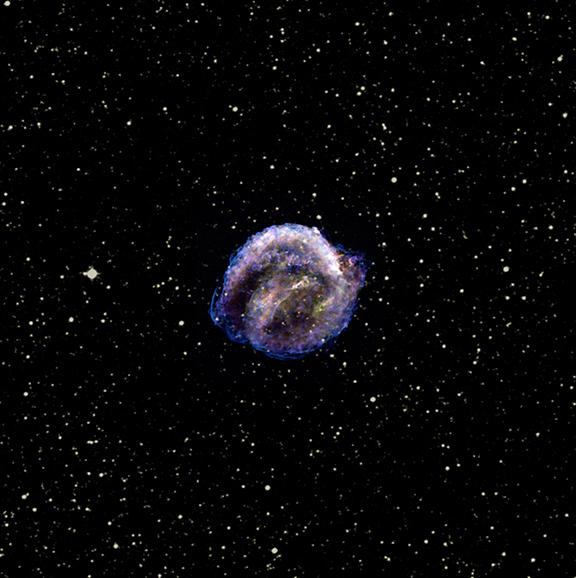 By comparing the relative amounts of oxygen and iron atoms in the supernova, the scientists were able to determine that Kepler resulted from a Type Ia supernova. In solving the mystery of Kepler's identity, Reynolds and his team have also given an explanation for the dense material in the remnant. Kepler could be the nearest example of a relatively rare "prompt" Type Ia explosion, which occur in more massive progenitors only about 100 million years after the star formed rather than several billion years. If that is the case, Kepler could teach astronomers more about all Type Ia supernovas and the ways in which prompt explosions from massive stars differ from their more common cousins associated with lower mass stars. This information is essential to improve the reliability of the use of Type Ia stars as "standard candles" for cosmological studies of dark energy as well as to understand their role as the source of most of the iron in the universe. In the new Chandra Kepler image, red represents low-energy X-rays and shows material around the star -- dominated by oxygen -- that has been heated up by a blast wave from the star's explosion. The yellow color shows slightly higher energy X-rays, mostly iron formed in the supernova, while green (medium-energy X-rays) shows other elements from the exploded star. The blue color represents the highest energy X-rays and shows a shock front generated by the explosion.